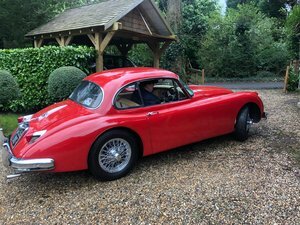 Hexagon Classics are delighted to offer this rare matching-numbers example of an XK 150 3.8 S DHC, which was originally supplied by Ritchies of Glasgow on 5th August 1960 to Mr David Gordon. In 1981 he sold the car to Richard De La Rue. 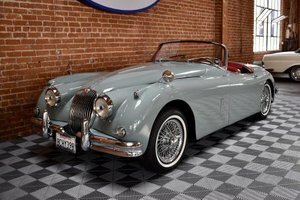 Introduced in 1957, the XK 150 was a more than worthy competitor for the BMW 507 and Mercedes-Benz 300 SL, and as the final evolution of the XK series, was the best and most highly developed. 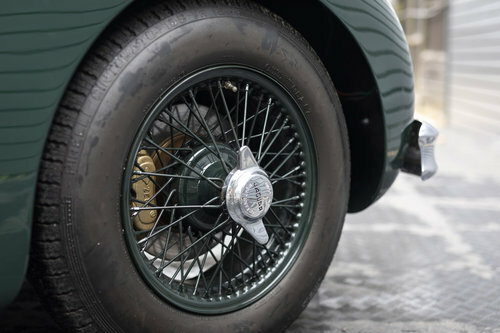 Styling was updated with a higher belt line, whilst race-bred four-wheel disc brakes, the first fitted to any production car, provided stopping power to match the car’s prodigious performance. 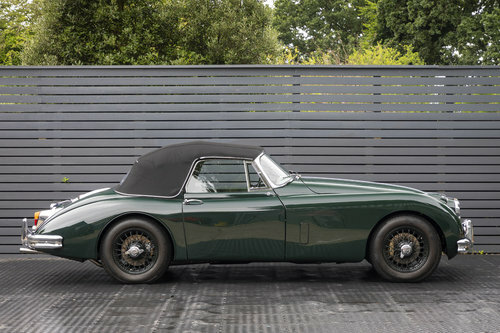 About 2,600 XK150 Drophead coupes were built before production ceased in 1961. Just 69 cars were RHD 3.8 S drop heads. 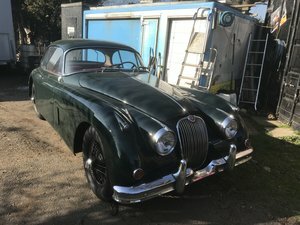 The launch specification of the XK 150 included SU carburettors, four-speed manual gearbox with overdrive, independent front suspension with wishbones, coil springs, torsion bars and anti-roll bar, rigid rear axle with semi-elliptic leaf springs, and four-wheel hydraulic disc brakes. 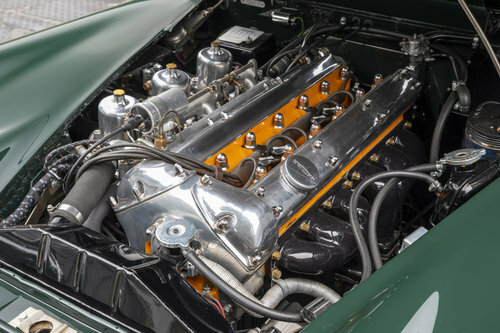 In 1960, Jaguar increased the engine size to 3781cc, providing the cars with a class-leading 220 bhp. The optional 150 “S” variant, was tuned to develop 265 bhp enabling it to reach over 135 mph. 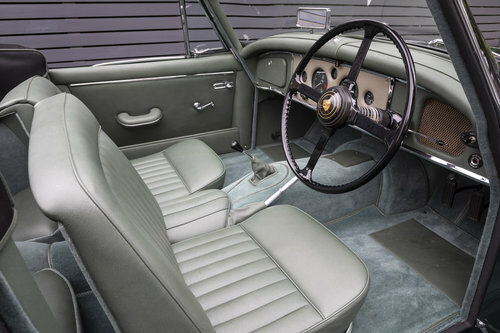 The torque figure was 260 lb/ft. at 4,000 rpm! 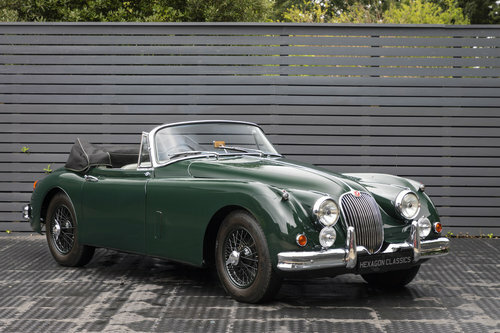 This ultra-rare 1960 XK150 3.8S DHC, has had just 5 custodians from new, with the first keeper owning her for 23 years. 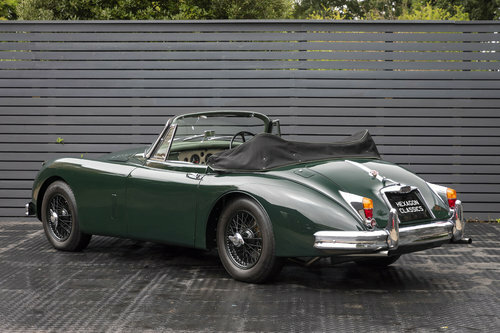 Hexagon Classics embarked on a 100-point £166,000 body-off restoration in its original colour scheme by Jaguar marque experts, not forgetting the Pumpkin orange cylinder head unique to this model. Variable power steering and Pirelli Cincurato CA67 tyres have has also been added to greatly enhance the driving experience. 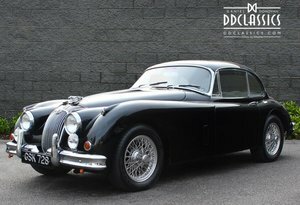 This utterly beautiful XK 150S is now complete and would be ideal for touring or rallying.